While Pope Benedict XVI’s resignation and the end of his pontificate are still sending shock waves throughout the world, Catholic World Report spoke with a senior theologian, Don Nicola Bux, among the closest collaborators of Benedict XVI, especially regarding liturgical matters, as he is a consultor to the Office of Liturgical Celebrations of the Supreme Pontiff. Don Nicola Bux, a priest of the Archdiocese of Bari, has studied and taught in Jerusalem and Rome. Professor of Eastern liturgy and theology of the sacraments in the Puglia Theological Faculty, he is consultant for the international theological journal Communio. Benedict XVI appointed him peritus (theological expert) at the synods of bishops on the Eucharist in 2005 and of the Middle East five years later. He has authored numerous essays and ten books, already translated in many other languages. Among his books is Benedict XVI’s Reform: The Liturgy Between Innovation and Tradition (Ignatius Press, 2012). Don Nicola Bux met Joseph Ratzinger in mid-1980s, when Cardinal Ratzinger had just arrived in Rome from Munich of Bavaria to assume duty as the new of Prefect of the Congregation for the Doctrine of the Faith. “In that time I participated in the Spiritual Exercises that Ratzinger held for the priests of Communion and Liberation”, Don Bux recalls. CWR: What is your opinion about the decision made by Benedict XVI? Fr. Bux: First of all, this gesture must be seen in the perspective of faith, and not from an earthly viewpoint, which always tends to manipulate the Church. There have been various interpretations of the gesture: from the secularization of the papacy to a revolutionized ecclesiastical power, from the democratization of authority to the wounds inflicted on the body of the Church, even by exchanging a request for pardon for one of its defects, or with the questioning of papal infallibility. But did the abandonment of Benedict IX, Celestine V and Gregory XII produce all this? Ratzinger himself has investigated in his studies how the Petrine primacy has a martyrological dimension: the responsibility of the Bishop of Rome is by all means personal and may not be diluted into episcopal collegiality, although it is always interacting with it. And it’s impressive that Benedict XVI decreed the canonization date (May 12, 2013) of the Martyrs of Otranto for their heroic witnessing to the faith by shedding their blood precisely in the same consistory of the very same date, February 11th, when he announced his resignation. CWR: Is the responsibility you are talking about related to the “consciousness” which Pope Beneidict often referred to especially in his battles against contemporary relativism? Compared to contemporary relativism that prompts consciousness into doing what one wants, for us it is the capacity to distinguish between good and evil, true and false. It is the “voice of God”. It’s the only defense to preserve the dignity of the person in his/her relationship with the world. CWR: The Pope asked his conscience at length and, therefore, with great spiritual suffering. Is it for this reason that you speak of “martyrological dimension” of the Petrine primacy? Fr. Bux: Yes. The Petrine ministry has an inner martyrological dimension that enables one to incessantly ask whether, in conscience, what one is and what is being done are adequate to what are the inner aspects of the ministry of the Roman Pontiff. Such daily exercise can actually become martyrdom. Fr. 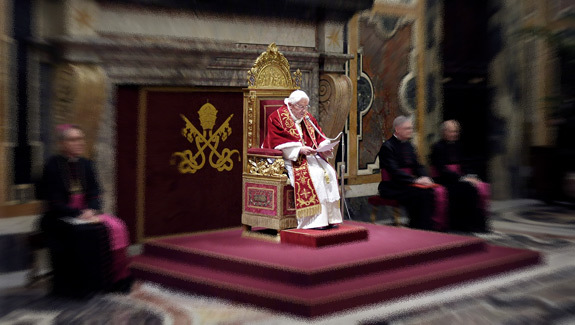 Bux: I firmly believe that what really matters in the realism of this Pope is for the (Petrine) ministry not to be regarded as personal property, but to be seen as a “service” to which he was called, for which he considers himself a “worthless servant”, just as Jesus himself said. What really matters is the apostolic succession that is always guaranteed by the Holy Spirit. The Pope, any Pope, is but a “ring” in the “chain”of the apostolic succession from Peter to the end of time, when the Lord will be back. Bearing this in mind, then we may very well understand that the Lord is constantly watching over this succession. CWR: Benedict is elderly and physically worn out. To what extent has his physical condition weighed on his decision? Fr. Bux: It did weigh. It’s true that one’s physical well-being has never been a benchmark for the government of the Church. John Paul II did show that to us. But as health decreases, also his capabilities to govern the Church are on the wane. Such government, albeit being a task of the Pope, would be wielded by others close to him. Had the Holy Father reasoned so, he would not have abided by the realism he has always shown. CWR: You mean that asking his conscience before God was a way of asking whether and how Benedict XVI was still able to adequately govern the Church, especially in the face of the relativism he has fought? Fr. Bux: Relativism has generated a lot of confusion, even in the Church in terms of doctrine and pastoral. In my opinion, the renunciation [of the papal office] by the Pope could be construed as an act of government, an invitation to reflect on our divisions, as mentioned in his homily on Ashes Sunday, and the confusion caused by non-Catholic ideas in theology. He made, as we may say, one step back. A step back made for the Church to make two steps forward. CWR: Essentially, he thought of the good of the Church, as indeed said on Monday, February 11th, and not of himself. Fr. Bux: Stay hidden from the world, as the Lord after Ascension, is a way to be even more present to the Church. He is and will remain Benedict XVI in Church history, albeit having decided to renounce wielding his munus (= office) to death. CWR: There are those, like people close to Karol Wojtyla, that have seen this resignation as a “descent from the Cross”. Fr. Bux: You saw the photo that went around the world, didn’t you? That of the dome of St. Peter with a lightning in the background? 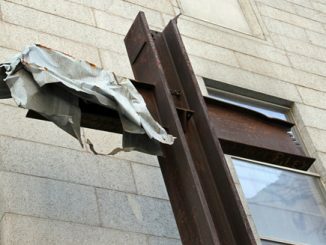 There were those who even said it was a sign of God’s wrath for the act of the Holy Father. And if we should interpret it as a sign directed to us all? In much the same way as the earthquake and the darkness on Golgotha that ​​were not directed to the Son of God, but to the men who had not recognized Him as such. CWR: There are those who said that the resignation of the Pope was a gesture of humility. Fr. Bux: We need to understand “humility” in the etymological sense of the term that comes from humus, ground. Humble is the person who is well anchored to the ground, in short, a realist. We are all called to be humble. In the final stage of many pontificates, the murmuring that the Pope no longer governs and it’s his entourage doing so instead, has been widely circulated. Therefore, Benedict XVI has renounced his ministry as Supreme Pastor of the Universal Church in full conscience and freedom for the good of the Catholic Church when he realised he was no longer in a position to fully exercise his mandate. CWR: What do you mean for reform of the Church? Fr. Bux: The concept of reform is not to be understood in the Protestant way or in political terms, but in its etymological sense of “reshape”, get into shape. Today this means correcting the deformations of the liturgy in the Church that, as the Holy Father has time and again noted, have hardly become bearable, also at moral level … and in this sense the gesture of the Pope is an act of effective warning. CWR: To govern the Church today: what does that mean? Fr. Bux: It means to overcome her internal divisions caused mostly by conflicts, also virulent ones, with regard to post-conciliar interpretations of Vatican II. Benedict XVI delivered clear messages in the direction of continuity in the relationship between tradition and innovation, a message that may not in any way be rejected. The appeal to Catholics is for them to close ranks and overcome one-sidedness and factionalism. CWR: Benedict XVI has done a lot for the unity of the church. He cancelled the excommunication on the Fraternity St. Pius X, founded by Archbishop Marcel Lefebvre, which however has yet to be readmitted into full communion with the Catholic Church. Fr. Bux: We must continue on this path. Again, the Holy Father was very, very patient in seeking unity: a final destination that is built day by day. He has been and remains an example of patient charity toward all, as the Apostle says, and also for the future Pope. Until one flock is formed under one shepherd.